For other uses, see Thunderbolt (disambiguation). Zeus' head and thunderbolt on a coin from Epirus, 234 BC. 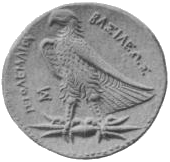 The thunderbolt pattern with an eagle on a coin from Olympia, Greece, 432-c.421 BC. Zeus' head and thunderbolt on a coin from Capua, Campania, 216-211 BC. A thunderbolt or lightning bolt is a symbolic representation of lightning when accompanied by a loud thunderclap. In Indo-European mythology, the thunderbolt was identified with the 'Sky Father'; this association is also found in later Hellenic representations of Zeus and Vedic descriptions of the vajra wielded by the god Indra. It may have been a symbol of cosmic order, as expressed in the fragment from Heraclitus describing "the Thunderbolt that steers the course of all things". In its original usage the word may also have been a description of the consequences of a close approach between two planetary cosmic bodies, as Plato suggested in Timaeus, or, according to Victor Clube, meteors, though this is not currently the case. As a divine manifestation the thunderbolt has been a powerful symbol throughout history, and has appeared in many mythologies. Drawing from this powerful association, the thunderbolt is often found in military symbolism and semiotic representations of electricity. Lightning plays a role in many mythologies, often as the weapon of a sky god and weather god. As such, it is an unsurpassed method of dramatic instantaneous retributive destruction: thunderbolts as divine weapons can be found in many mythologies. in the Torah, the word for "arrow", khets חֵץ, is used for the "arrows" of YHWH/Elohim, which are represented as lightnings in Habakuk 3:11, but also as general calamities inflicted on men as divine punishment in Deuteronomy 32:42, Psalm 64:7, Job 6:4, etc. In Hittite (and Hurrian) mythology, a triple thunderbolt was one symbol of Teshub (Tarhunt). Vedic religion (and later Hindu mythology) the god Indra is the god of lightning. His main weapon is the thunderbolt (Vajra). In Greek mythology, the thunderbolt is a weapon given to Zeus by the Cyclops. 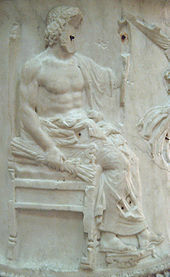 Based on this, in Roman mythology, the thunderbolt is a weapon given to Jupiter by the Cyclops, and is thus one of the emblems of Jupiter, often depicted on Greek and Roman coins and elsewhere as an eagle holding in its claws a thunderbolt which resembles in form a bundle of crossed sticks. In Celtic mythology, Taranis is the god of thunder, in Irish, Tuireann. In Nordic mythology, Thor is specifically the god of thunder and lightning, wielding Mjolnir. In Turkish mythology, Bayülgen creates the thunderbolts. In Maya mythology, Huracan is sometimes represented as three thunderbolts. In Guaraní mythology, Tupã is the embodiment of thunder and has power over lightning. In Igbo mythology, the thunderbolt is the weapon of Amadioha/Amadiora. In Yoruba mythology, the thunderbolt is the weapon of Shango. In Tibetan Buddhism, the Vajra or thunderbolt is symbol of Vajrayana branch. In Paleo-Balkan mythology, Zibelthiurdos (also "Zbelsurdos", "Zibelthurdos"): a god recognized as similar to the Greek Zeus as a wielder of lightning and thunderbolts. In Navajo mythology, the hero twins, Naʼídígishí and Naayééʼ Neizghání, have bows that shoot thunderbolts as arrows. In Chinese mythology, Lei Gong uses thunderbolts as a weapon and his wife, Tian Mu, creates the accompanying lightning flashes with her mirror. The name "thunderbolt" or "thunderstone" has also been traditionally applied to the fossilised rostra of belemnoids. The origin of these bullet-shaped stones was not understood, and thus a mythological explanation of stones created where a lightning struck has arisen. The thunderbolt or lightning bolt continues into the modern world as a prominent symbol; it has entered modern heraldry and military iconography. The thunderbolt is used as an electrical symbol. A thunderbolt is used in the logo of the Australian hard rock band AC/DC. Numerous fascist organizations such as the Schutzstaffel and the British Union of Fascists have historically used thunderbolts as their symbols. In the DC Universe, the thunderbolt is the symbol seen on the chest (or from the chest to the belly) of the costumes worn by Captain Marvel, the Flash, Black Lightning, and Static. In the Marvel Universe the thunderbolt is the symbol seen on the torso of the costumes worn by Quicksilver, Black Bolt, and is also the name of a superhero team. The thunderbolt is used in the logo of the American franchise Power Rangers. In the Harry Potter franchise, the scar on Harry's forehead is in the shape of a thunderbolt. The letter "P" in the Harry Potter logo is also designed in the shape of a thunderbolt. In the novel The Godfather, "being hit with the thunderbolt" is an Italian expression (colpo di fulmine) referring to a man being spellbound at the sight of a beautiful woman (like the so called love at first sight). The novel's emerging main character is affected in this fashion and eventually marries a woman whose appearance initially affects him in this way. In the Pokémon media franchise, Thunderbolt is the name of a powerful Electric type attack. The thunderbolt is the mascot of Cranston High School East in Cranston, Rhode Island. Look up thunderbolt in Wiktionary, the free dictionary. ^ Plato (2008). Timaeus. 1st World Publishing. p. 15, paragraph 22C-D in original. ISBN 9781421893945. Retrieved August 3, 2012. ^ Clube, Victor; Napier, Bill (1982). The cosmic serpent: a catastrophist view of earth history. Universe Books. p. 173ff. ISBN 9780876633793. ^ Geoffrey Peckham. "On Graphical Symbols". Compliance Engineering. Archived from the original on December 16, 2011. Retrieved August 3, 2012. Wikimedia Commons has media related to Thunderbolt.